The insurance industry has recorded a growth of 14.59%, in terms of Gross Written Premium (GWP), during the first quarter of year 2016 when compared to the same period in the year 2015. 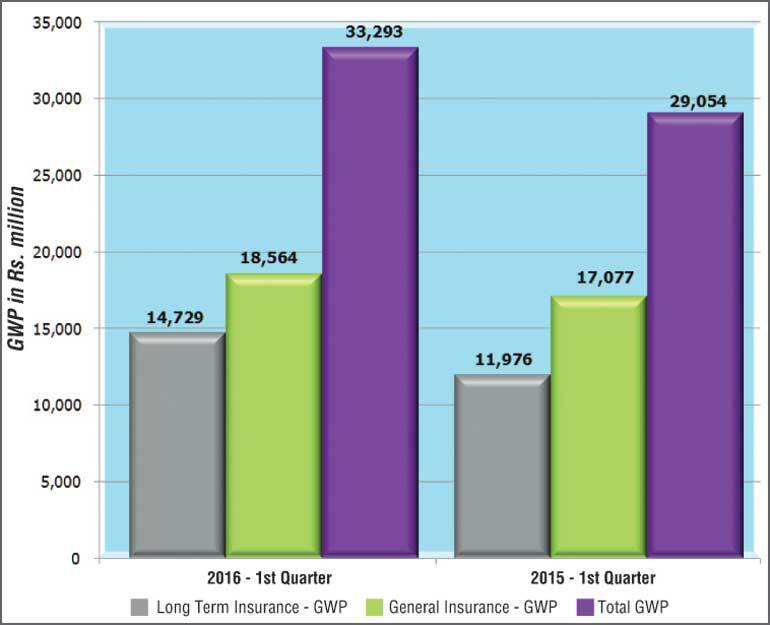 The Insurance Board of Sri Lanka said GWP for Long Term Insurance and General Insurance Businesses for the first quarter ending 31 March 2016 was Rs. 33,293 million compared to the first quarter of 2015 amounting to Rs. 29,054 million. The GWP of Long Term Insurance Business amounted to Rs. 14,729 million (Q1, 2015: Rs. 11,976 million) while the GWP of General Insurance Business amounted to Rs. 18,564 million (Q1, 2015: Rs. 17,077 million) during the first quarter of 2016. Thus, Long Term Insurance Business and General Insurance Business witnessed a GWP growth of 22.98% and 8.71% respectively when compared to the corresponding period of year 2015. Total assets of insurance companies have increased to Rs. 457,695 million as at 31 March 2016, when compared to Rs. 432,593 million recorded as at 31 March 2015, reflecting a growth of 5.80%. The assets of Long Term Insurance Business amounted to Rs. 307,578 million (Q1, 2015: Rs. 267,719 million) indicating a growth rate of 14.89% year-on-year. The assets of General Insurance Business amounted to Rs. 150,117 million (Q1, 2015: Rs. 164,874 million) depicting a decline in growth rate of -8.95%, at the end of first three months of 2016. At the end of first quarter of 2016, investment in government debt securities amounted to Rs. 128,971 million representing 41.93% (Q1, 2015: Rs. 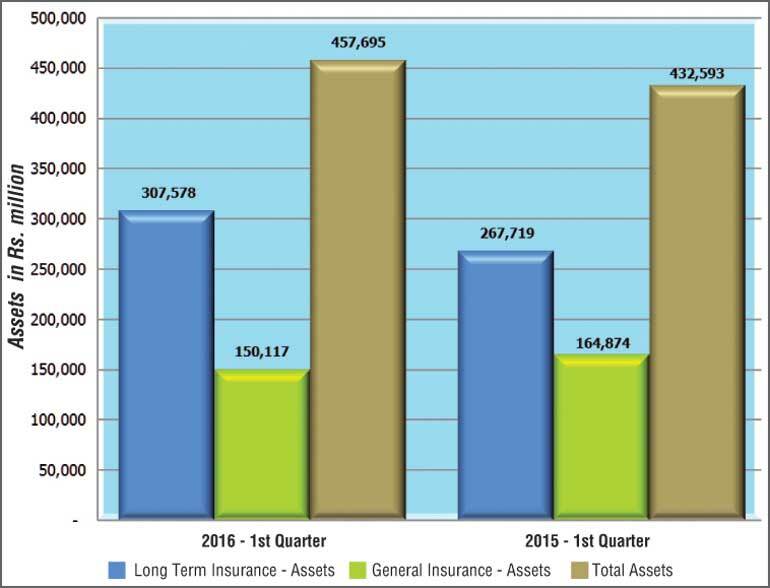 121,936; 45.55%) of the total assets of Long Term Insurance Business, while such investment of the total assets of General Insurance Business amounted to Rs. 29,034 million representing 19.34% (Q1, 2015: Rs. 27,038; 16.40%). Accordingly, the total investment of both Long Term Insurance Business and General Insurance Business in government debt securities amounted to Rs. 158,005 million (Q1, 2015: Rs. 148,974 million) as at 31st March 2016. The investment in government debt securities for both Long Term Insurance Business and General Insurance Business has increased by 5.77% and 7.38% respectively. The profit (before tax) of insurance companies in both Long Term Insurance Business and General Insurance Business has increased to Rs. 2,713 million (Q1, 2015: Rs. 2,491 million) showing a growth in profits by 8.93%. The profit (before tax) of Long Term Insurance Business amounted to Rs. 2,067 million (Q1, 2015: Rs. 1,957 million) while the profit (before tax) of General Insurance Business amounted to Rs. 646 million (Q1, 2015: Rs. 534 million) during the first quarter of 2016. Thus, profit (before tax) of Long Term Insurance Business and General Insurance Business witnessed a growth of 5.66% and 20.90% respectively, when compared to the corresponding period of year 2015. Out of 28 insurance companies (insurers) in operation as at 31 March 2016, 12 are engaged in Long Term (Life) Insurance Business, 13 companies are carrying out only General Insurance Business and three are composite companies (dealing in both Long Term and General Insurance Businesses). Fifty-seven insurance brokering companies registered with the Board as at 31 March 2016, mainly concentrate in General Insurance Business. Total Assets of insurance brokering companies have increased to Rs. 3,670 million as at the end of first quarter of 2016 when compared to Rs. 3,488 million recorded as at 31 March 2015, reflecting a growth of 5.23% year-on-year.